Now that LeBron James is a two-time NBA champion and four-time league MVP, one superstar receiving a lot of criticism about his inability to win in the playoffs is New York Knicks forward Carmelo Anthony. Anthony has reached the conference finals just once in his 10-year career, which came in the 2008-09 season when his Denver Nuggets were eliminated by the eventual champion Los Angeles Lakers. Since joining the Knicks in the 2010-11 season via a trade with the Nuggets, Anthony has been eliminated in the first round twice and lost in the second round last year to the Indiana Pacers. He can become a free agent next summer if he opts out of his contract, and unless the Knicks are able to bring in more talent to help him win a title, he may choose to leave New York. 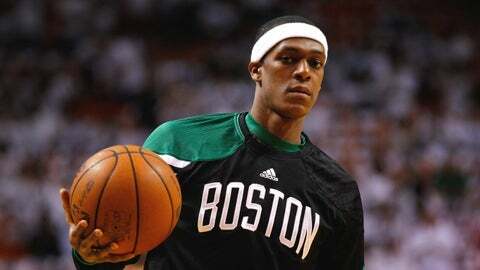 According to Oak Hill Academy (Va.) basketball coach Steve Smith, one player who Anthony is recruiting to join him in the Big Apple is Boston Celtics point guard Rajon Rondo, one of the NBA’s top point guards when healthy. Smith coached Anthony and Rondo at Oak Hill, and revealed this interesting piece of news during an interview with USA Today’s Jason Jordan when asked about Rondo’s return to the court after ACL surgery. Rondo’s contract expires after the 2014-15 season, and that summer, New York is expected to have the salary cap space required to make a significant addition to its roster through free agency and give Anthony (if he’s still on the team) a superstar teammate. According to HoopsHype, just five Knicks players are signed through or have team/player options for the 2015-16 season. Just last month, Adrian Wojnarowski of Yahoo! Sports reported that the Knicks may try to sign Minnesota Timberwolves star Kevin Love as a free agent in 2015.